This is an exquisite and elegant dish using Salmon in Tomato Sauce, made with very ripe plum tomatoes, olives, and red peppers. While it may sound complicated, this dish is actually really easy to prepare. Your dinner will be ready in less than 30 minutes! 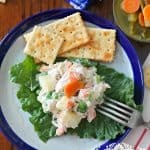 Not only is this a perfect recipe for Lent and Easter, but it’s also a great meal to impress your guests with! This post was sponsored by The Norwegian Seafood Council, but all opinions are my own. At home, I’m the one that’s always craving a meal that has some sort of sauce. Dishes like Steak a la Mexicana, Picadillo (ground beef with potatoes), or other dishes similar to stews. This is why I made this salmon recipe today, and I was thrilled with how the tomato sauce came out! The sauce in this dish is similar to those in dishes with the names “a la Veracruzana” or “a la Vizcaína”. Do you remember how in previous posts I mention how Mexican cuisine is a fusion of several cultures? Well, this dish is inspired by the Spanish influence on Mexican cuisine, which includes the use of olives and wine. For this recipe, I am using delicious and buttery salmon filets from Norway. Norway is the second largest exporter of seafood in the world, and you can find Norwegian fish all over the USA, in places like Whole Foods, Costco, Trader Joe’s, and Walmart. Like all fish, salmon is rich in Vitamin D, which helps to produce healthy skin and bones. This just makes this dish even better, as it’s both delicious and good for you! Make sure that the salmon is at room temperature when you start cooking. The cooking time will vary depending on the thickness of each filet. *The tomatoes need to be very ripe, in order to render a juicy and thick sauce. Heat the olive oil in a frying pan at medium-high heat, then add the onion and the garlic and sauté for one minute. Add the tomato and the red pepper to the frying pan. Lower the heat and cover. While this is cooking, grab another frying pan and heat the vegetable oil at medium-high heat. Once the oil is hot, place the Salmon on the pan skin-side down. Make sure the oil is hot, in order to keep the skin of the salmon from sticking to the bottom of the frying pan. Gently press down on the fish to help it keep its shape, since it tends to curl up during the first minute. Keep cooking for about 3 minutes in total. In the other pan, stir the tomato sauce and add the green olives and the white wine. Season the sauce with salt and pepper. Keep simmering on a low heat setting with the lid on. After the salmon has cooked for three minutes, flip to cook for 2 more minutes on the other side (see notes about cooking times). 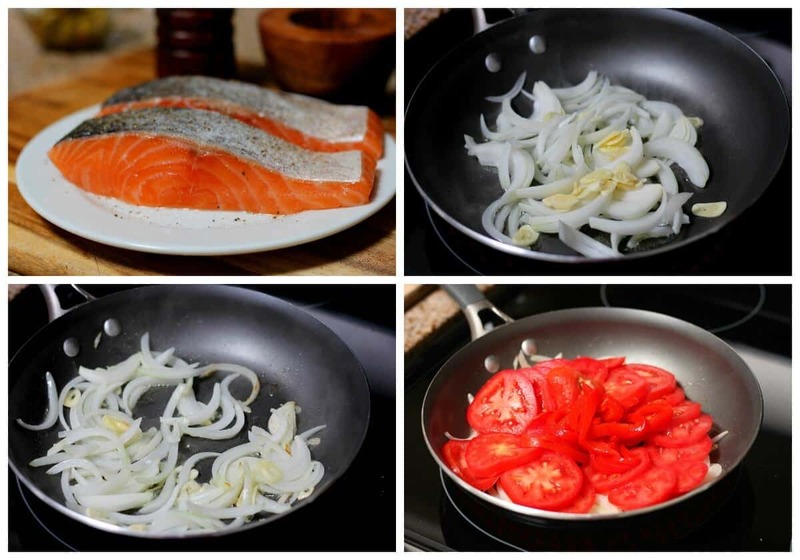 Using a spatula or a pair of kitchen tongs, place the salmon into the frying pan with the tomato sauce. Turn the heat off and let the salmon sit there for 2 minutes to absorb all the flavors. Even though the heat is off, the Salmon will continue to cook with the heat of the tomato sauce. At serving time, garnish the Salmon with the tomato sauce and some parsley leaves. This Salmon recipe has a resemblance to other recipes here on the blog, but is simpler and quicker. In a matter of 30 minutes or less, your dinner will be ready. Enjoy! This is an exquisite and elegant dish using Salmon in Tomato Sauce, made with very ripe plum tomatoes, olives, and red peppers. While it may sound complicated, this dish is actually really easy to prepare. Your dinner will be ready in less than 30 minutes! The Norwegian Seafood Council in the U.S. offers recipes, nutritional information, as well as tips for shopping for fish and preparing fish – all available on fromnorway.com. Follow @NorwaySeafoodUS across Facebook, Twitter and Instagram. This has been a sponsored campaign in partnership with the Norwegian Seafood Council, all opinions are my own. Filed Under: Lent, Seafood Tagged With: olives, red peppers, Salmon, Tomatoes, white wine. Mely, I have used Pescado de la Vericruze recipe with salmon many times, However, the addition of the wine produced a new level to my recipe. Thanks for the taste. Yes, it does taste fantastic with the addition of wine. Thank you for another great recipe Mely. My husband loves everything I cook from your blog. It was a fine recipe, Mely. We definitely need to try it soon. I totally agree with you. Mexican cuisine is indeed a fusion of various cultures. It also has a Spanish influence. Nowadays there isn’t a single Mexican cuisine, but instead, a variety of them that change from region to region due to climatic, geographical and ethnic differences. 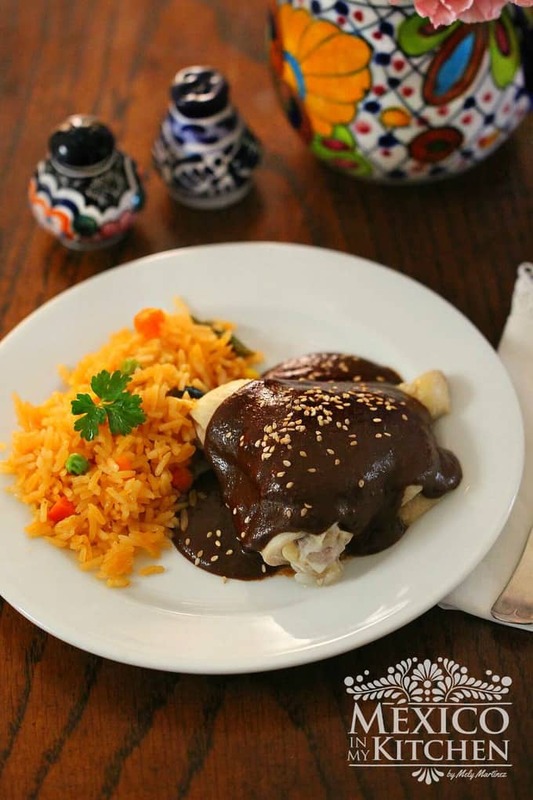 I recently tried mole poblano after reading about it It was a delightful experience.